The Webster county tract represents a good timber investment in that it contains well managed, nearly mature pine plantations along with younger plantations, to provide more frequent cash flows. These plantations are growing on highly fertile sites. The Webster 160 tract contains approximately 159.1 acres. The majority of the tract, 93 percent, is forested. 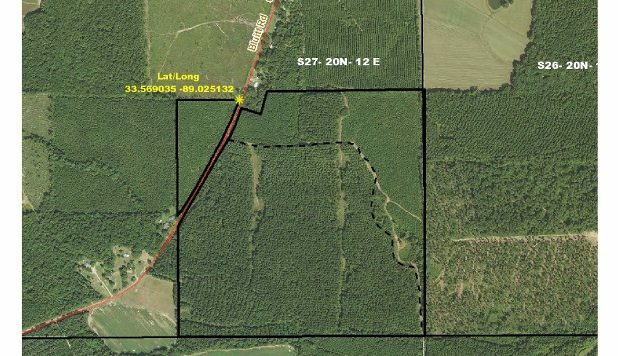 The property is located in the extreme southeast corner of Webster County, with the east boundary of the tract being the Clay County line and the south boundary being the Oktibbeha County line. The tract is situated three miles east of the small town of Maben. It is 13 miles northwest of Starkville, Mississippi, which is the home of Mississippi State University, the largest university in the state. The tract has good access, as Bluitt Road (County Road 192) runs through the northwest corner of the tract offering about one-half mile of paved road frontage. The tract has interior access provided by a dry-weather-only woods road. The tract has significant timber value. About 90 acres, or 57 percent of the tract, support a 26-year-old loblolly pine plantation established on former cropland. This 1990 plantation is nearing financial maturity and has an estimated timber value of $2,070 per acre. Additionally, there are 16 acres of 24-year-old plantation as well as about 39 acres of pre-merchantable pines. The tract also includes about ten acres in wildlife openings and food plots. Webster 160 is located one mile southwest of the Clay 310 tract, which is also for sale. The Webster 160 tract has nearly level topography. Elevation changes only by 20 feet and ranges from 320 to 340 feet above sea level. Two small drains flow into nearby Four mile Creek. There are no ponds, lakes, or other topographic features. The tract is situated in the SE¼ of Section 27, Township 20 North, Range 12 East, Webster County, Mississippi. The lat/long where the north line crosses Bluitt Road is 33.569035, -89.025132 The combination to the gate on the east side of the road is 4006. Note, the owners of this tract have a total of six tracts for sale, and they are all featured on this website. They are Jasper 120, Montgomery 420, Montgomery 133, Clay 310, and Webster 160.